I have always had my hand in art whether it was making pins out of old watch parts, doing calligraphy or framing pictures. Although I thought of myself as a creative person, I didn't have the confidence to believe that I truly was an artist. In my mind artists were people like Picasso or Monet. I was very creative with dreams and ideas, yet I felt lost as to how to express myself in a way that reflected who I really was and where I was headed - with my art. It wasn't until we returned home from a visit to New York City in May of 2007 that I started taking my painting more seriously. As we were leaving, our son-in-law Jason handed me "The War of Art" by Steven Pressfield. The book was all about overcoming resistance. After my visit to one of the most artistic places in the world where one is surrounded by an abundance of bustling action and sensual art, I came home feeling alive. I made four paintings and sold them right away. Hey, this seems pretty easy. Wrong! The reality was that I had a Bachelor's degree in Art from San Francisco State University but it was the late '60's and they didn't believe in teaching basic art techniques. All universities during this time had the philosophy of "just do your own thing." They didn't want to hold you back with details. It sounded good, but for me it definitely didn't give me any confidence. I began with acrylics and felt frustrated while trying to paint my beautiful multi-colored sweet peas that were growing in the garden. I couldn't get the colors I wanted so I switched to oils. I was so frustrated with painting wet on wet that I bought books on the technique and finally figured it out. Falling in love for the first time at age 50 changed my life. During our first date, I knew I had found my soul mate. He was a designer/builder, painter and oh ... so much more. He believed in my talent so much that he told me to just paint and not worry about making any money. As long as I continued to paint, he would support me. This was and still is the most amazing gift I have ever seen given. Before this time, the art I chose to do was determined by how much money I could sell it for. So for me, the art I created at that time wasn't sheer freedom to be in the creative process. There were numbers attached and the stress to create the project distracted me from the creative process of just "being in the moment." 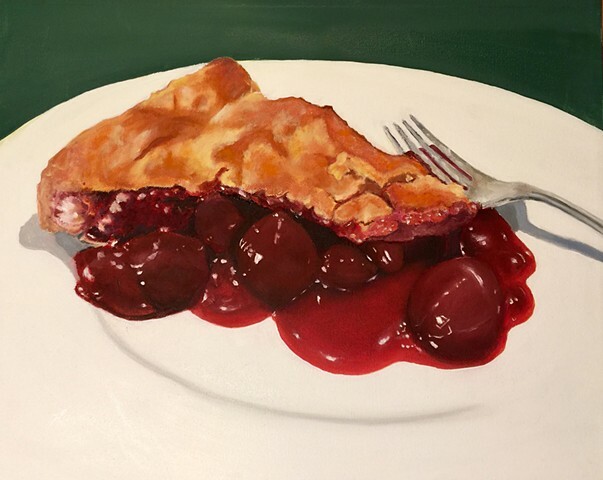 In 2009-2010 I painted my PIE SERIES. I'm a master pie baker so why not paint what I love. In the Fall of 2011, I got stuck. What should I paint? What style do I want to paint in? I was getting rave reviews of my paintings yet I needed to be working on something more soulful. Everyone thinks painting is fun. Sometimes it is, but a lot of times it's a struggle. John, my supportive husband, suggested I put my brushes away for awhile and do some sketching. I started working with CHARCOAL and found that I had a natural talent for capturing personalities in my sketches of both humans and animals but I really wanted to get back to painting. In February f 2012, feeling frustrated with the long rehab from a full knee replacement I started working on abstracts. At first, I tried abstracting realism but I felt something was missing. One day, after a frustrating phone call with my internet carrier, I thought, "why not paint what I'm feeling?" This was the beginning of my new ABSTRACT SERIES. To do this, I close my eyes and try to visualize what colors represent what I'm feeling. Sometimes it's difficult to get out of my left brain so I grab my iPod and listen to Mose Allison, Leonard Cohen or Lambert Hendricks and Ross which immediately gets me into my right brain zone. In May of 2014, we left La Boheme, our artist retreat that my husband designed and built for us in the Oakland Hills. In the Fall of 2016, we started building another artist retreat in El Sobrante. I'm starting in on a new PIE SERIES while continuing with my ABSTRACTS. Yes, it has been a process to learn to be creative and be free to paint "in the moment" and to capture feelings and subjects that matter to me. What is most rewarding though is to continue creating my paintings for others to enjoy.